I finally got down to doing some printing, or so I thought. I had done so much work on upgrades over the last while, that they had become more of a hobby than the actual 3D printing. I was printing and I noticed the extruder wheel was moving in a strange rhythm (normally it just rotates slowly) and the biggest clue filament was not exiting from the hot end at a regular rate. My printer has a Wade style extruder wheel. At first I thought I was just imagining things. Then the extruder wheel stopped for what seemed like several seconds thenstarted moving again. I then touched the extruder wheel gently to see what would happen and it just stopped. Ugh! This is not good. My first thought was that my gears were stripped or cracked. The gear wheel uses a fish bone pattern. A quick, visual review of the gears it seemed that all teeth were intact and everything looked good. It seemed that the extruder wheel was just stopping at random. Next, I thought I need to check the stepper motor and the driver\RAMPs board. I plugged the extruder stepper motor into the X stepper motor socket. With the extruder plugged into the X axis, instead of the X gantry moving now the extruder motor should turn. I was not going to heat up the extruder so I removed the filament before activating the X axis. It appeared to work for a moment then it stopped again. This indicated to me that the issue was at the extruder end and not at my Ramps board. I removed the stepper motor from its mounts and again activated the X axis. I touched the driver shaft gently and found that it still had issues randomly starting and stopping. At this point the issue seemed to be only one or two possible options. Either the wiring itself was bad or the stepper motor was bad. 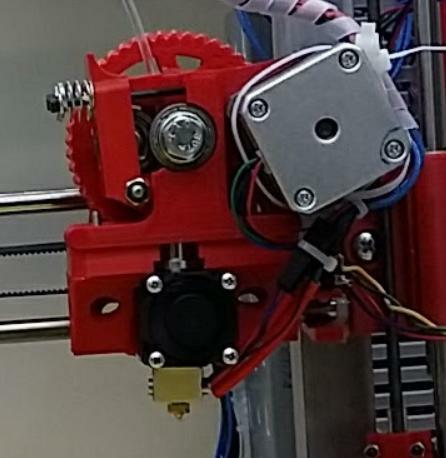 With the stepper motor still plugged into the X axis socket I made the shaft rotate and I followed the wiring back and forth from the motor to the connector bending and twisting the wiring. It ran fine through my testing. I touched the shaft again and it immediately stopped. I concluded that the stepper motor was failing and needed replacing.